The Staybridge Suites Hotel in Jackson-Ridgeland, MS is an upscale, extended stay hotel, offering three suite options for you to choose from for one night stays or more. Each spacious suite in this Jackson hotel includes free wireless high-speed Internet access, dedicated phone number for each suite, premium television package including HBO. Every suite in our Jackson, MS hotel features a kitchen with a stove top, full size refrigerator, microwave, dishwasher, and all cooking and eating utensils. All rates at our hotel Jackson, MS include a daily deluxe complimentary breakfast buffet, Sundowner reception Tue-Thurs, complimentary fitness center, guest laundry facilities and swimming pool. Events: June-Jubilee Jam July- Canton Hot air Balloon Race August-Mississippi Wildlife Extravaganza September- Viking Classic formerly Southern Farm Bureau Golf Classic October- Canton Flea Market Mississippi Sate Fair and Southern Cutting Futurity November- Capital City Football Classic and Mistletoe Marketplace. 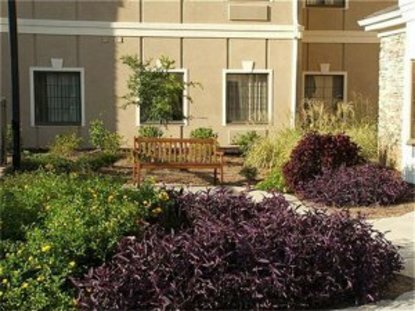 The Staybridge Suites Hotel Jackson-Ridgeland is near Mississippi Coliseum Fairgrounds, North Park mall and lots of restaurants.Come and stay at our Jackson-Ridgeland, MS hotel This hotel is committed to providing accessible facilities under the American Disabilities Act. If your accessibility needs are not met, please contact the Hotel Manager on Duty. Should you require additional information regarding accessible facilities for guests with disabilities, please call 1-800-Holiday (U.S. and Canada) or contact the hotel directly. For the hearing impaired, TDD service is available at 1-800-238-5544 within the U.S. and Canada.